This is the Russell Engineering developed cam for optimum street-sports use. Lumpy idle, pulls from 2,500rpm clean through to 7,500rpm+. With the right cylinder head and induction system this cam will give blistering street performance and very competitive hill-climb/track day/ sprint performance. 1.4:1 ratio rockers are required to maximise potential. 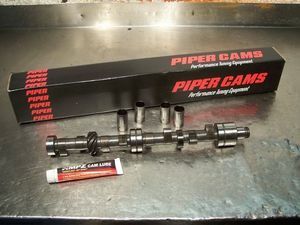 Now ground on brand new cam blanks, kit contains camshaft, quality followers, cam lube, valve springs and cam installation instructions.